Time to remember Peel’s Principles …. Having de-stressed myself from the perils of Rest Day 3 (the construction of my youngest’s new bedroom furniture from the cheerily delivered fourteen boxes, all complete with instructions in German, Portuguese, Swahili, Inuit and any other language but English) it struck me that the plan to improve policing in the UK is in fact a simple one ….. Whether you read the various blogs (of which I hope you find this one worthwhile; to pinch a phrase from someone else, I’m not Inspector Gadget lol), follow Twitterings, go through the moans on Facebook, or simply adopted that old fashioned and some would say out-dated approach of actually talking to your colleagues, it quickly becomes apparent that there are a good 140,000 or so people in this country who know exactly how to make the police work for the people. These are of course, the police officers we already have (yours truly included). You won’t have to get very far into conversation with any officer; Response Bobby, Neighbourhood Policing, CID Officer (if you can wake them up – sorry only joking !! ), or other department, before they will tell you …. with 100% accuracy …. exactly what is wrong with the way in which the various police forces are run and focussed in the UK today. So then, why is it, if so many people know what is wrong, and where the problems lay, that we are still in this state. How can the move to the third floor so efficiently remove all traces of your ability to police effectively and replace that with a lobotomised excuse for a leader of men (and women). Maybe they become hypnotised by the swinging pendulum that is the distant but regularly achievable OBE dangling on that shiny silk ribbon ……. as long as they toe the line. It matters not how times have changed since 1829 when Peel established the Metropolitan Police in London, the worlds first ‘modern’ police force. It’s well documented that the Police, even then, were not popular with certain sections of the community who became very vocal and active on the matter, leading to concerns the police were ‘a bad idea’. Thing was though, it was the miscreants, law breakers and ne’er-do-wells that were doing the complaining – the very people these early officers were targeting; dealing with; bringing to justice. This is not dissimilar to today – the people who complain most about the police now are the very, very small minority that we have to deal with on a daily basis; those that cause pain, discomfort and difficulty for the rest of society and don’t like to be told to stop ‘cos I know my rights innit’. The difference today is that we pander to them, continually giving them ground rather than pushing them back into a corner, much to the detriment of the hard working, law abiding majority of good people within our societies. Put it this way – other than as a victim of burglary, theft or car crime, how many ‘decent’ members of your local community have you had to deal with this month ? Back in 1829, the much larger, but silent majority were apparently very, very pleased with what the police achieved; and what they did manage within a few years was a massive reduction in crime. They were so successful that by 1857, all cities in the UK were obliged to form their own police forces based on the ‘Peel Principles’. We live in a different world today, but each and every one of Peel’s Principles does still apply. By scrapping all the shiny buzzwords, lead weight enwrapped paperwork, Brussels dictat and OBE grabbing headlines away, and returning to these basic ideals, we could turn the face of British policing round in an instant. 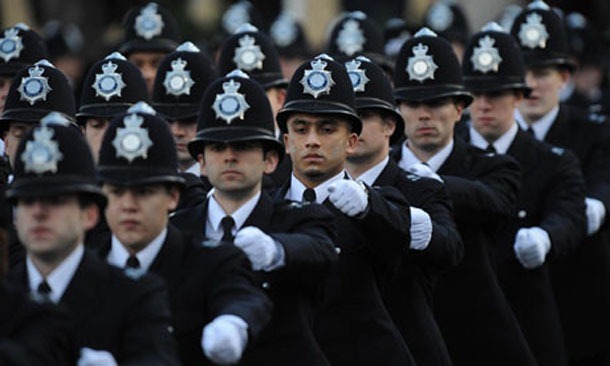 Maybe, rather than the Head of a major PLC or and ex-underwear model running for one of these new-fangled Police Commissioner Posts, they should be restricted to applications only from frontline police officers – who actually know how to do the job and make it better. Excellent blog again mate. You are saying exactly what the very vast majority of us say on a daily basis.